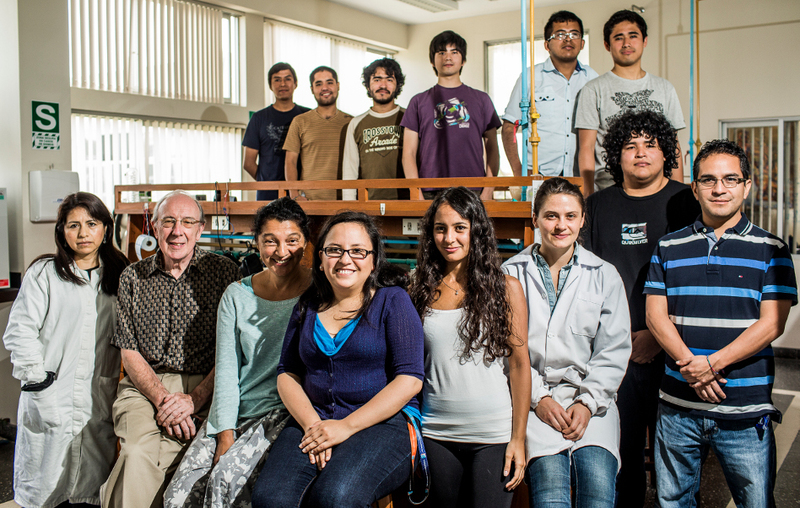 The Nuclear Magnetic Resonance (NMR) Facility at the Pontificia Universidad Catolica del Peru, the only NMR laboratory in the country, initiated its activities in 2003. The first instrument, a Bruker AC300 300 MHz, was upgraded to a Bruker UltraShield 300 MHz with a AVANCE III console in 2010, then, in 2015 to a Bruker Ascend 500 MHz with AVANCE III HD 500 MHz (equipped with an auto-sampler) and, more recently, with a Bruker CryoProbe. The facility is managed by Prof. Helena Maruenda (Organic/Analytical Chemistry) and Dr. Juan Lopez (Biomolecular NMR). 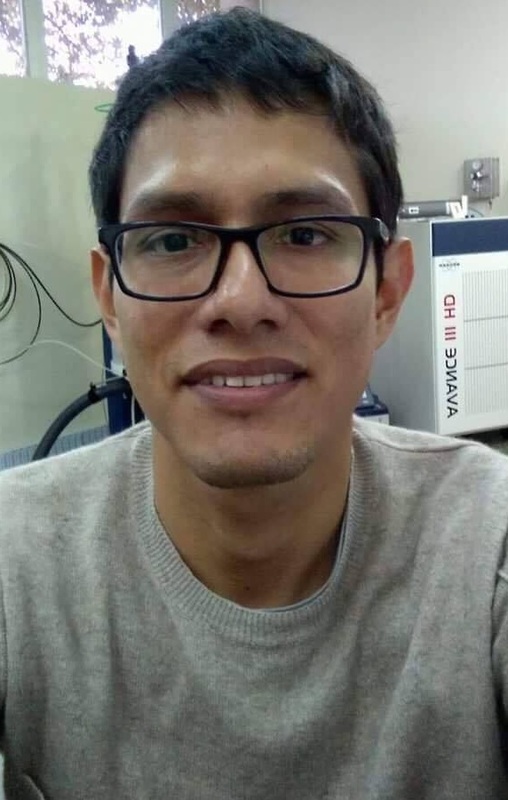 The instrument is dedicated to routine organic chemistry analysis and to the NMR metabolomic analysis of Peruvian fruits and other agricultural products. In collaboration with Dr. Roberto R. Gil (Carnegie Mellon), the structural configurations of several chiral natural products have been established. 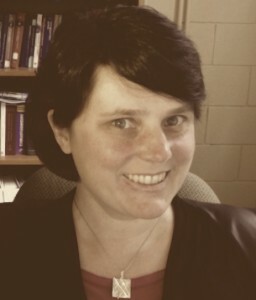 Our goals are now centered in pursuing biomolecular NMR aided by Dr. Tatyana Polevnova (U. Delaware) and Dr. Guy Lippens (CNRS-INSA Toulouse) to strengthen a new line of research within the facility “Nuclear Magnetic Resonance for Food and Health Science”. Metabolite profiling based on NMR has become a widely applied analytical tool for the identification and discrimination of fruits and other agricultural products according to species, origin, and ripeness, among others. Our interest focusses on different scenarios associated with the Peruvian agroindustry. The discrimination of plants where phenotypic variations are not evident morphologically, the exploration of Vanilla species from the Peruvian amazon as a potential source of new vanilla essence, the determination of optimal roasting conditions of specialty coffees, and the quantitation of carmine in cochineal extracts, are a few examples of studies being conducted in our laboratory in collaboration with several local companies and organizations. Trypanothione reductase (TryR) is a key enzyme in the metabolism of Trypanosoma cruzi, the parasite responsible for Chagas disease. The available repertoire of TryR inhibitors relies heavily on synthetic substrates of limited structural diversity, and less on plant-derived natural products. Our research is centered in searching for new lead natural product skeletons as inhibitors of TryR from the Peruvian flora. The information obtained from the in vitro and in silico evaluation of the potential leads against TryR, with no in vitro and in silico affinity for human glutathione reductase, is used to optimize the binding mode of the natural product lead through convenient chemical derivatization. Residual dipolar couplings enhanced NMR, in collaboration with Dr. R. Gil, are used to assign the absolute configuration of promising natural product leads. Novel methods in food and health sciences based on sensing devices associated with antibodies and oligonucleotides molecular probes are the focus of this line of research. The main objective is to improve the scope of traditional separative methods without compromising sensitivity and selectivity. The optical properties of metallic nanostructures, combined with vibrational spectroscopy or UV-Vis-NIR light are being used to analyze biomolecular systems as well as to quantify the presence toxins in agricultural products. 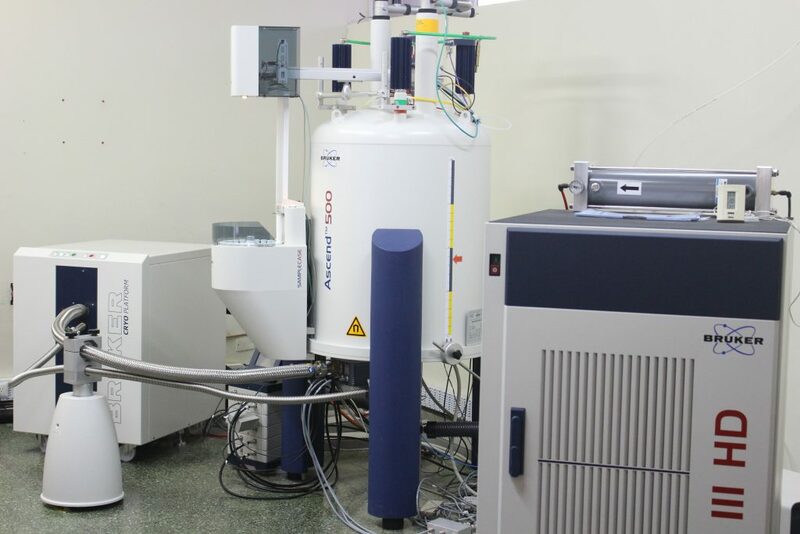 We employ NMR to characterize the binding recognition between molecular probe and analyte. From left to right: (back row) Christian Cañari (grad student-UC Berkeley), Alvaro Zevallos (undergrad student-PUCP), Rodrigo Cabrera (Master student-PUCP), Alonso Arguelles (grad student-U Michigan), José Montero (former undergrad student-PUCP), James Cabrera (grad student-U Texas at Austin); (front row) M.Sc. Ana Gonzalez, Dr. Geoffrey Cordell, Dr. Helena Maruenda, Dr. Betty Galarreta, M.Sc. Vanessa Leyva (former student), Anastasia Gant (former Fulbright Fellow, grad student-Duke U), Victor Zapata (former undergrad student-PUCP), M.Eng. 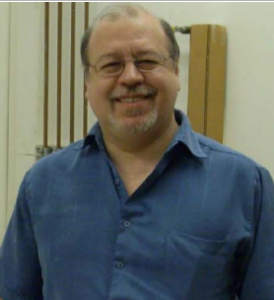 Alex Nieva (former member); missing: Dr. Juan Lopez, M.Sc. Nieves Flores, and Linda Soto (undergrad student-PUCP). 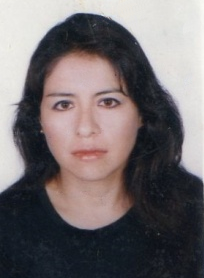 Gant, A.; Leyva, V. E.; GONZALEZ, A. E. MARUENDA, H. (2015). Validated HPLC-Diode Array Detector method for simultaneous evaluation of six quality markers in coffee. Journal of AOAC International, 98 (1), pp. 98-102. MARUENDA, H.; Vico, M. D. L.; Householder, E.; Janovec, J.; Cañari, C. L.; Naka, A. M.; GONZALEZ, A. E. (2013). Exploration of Vanilla pompona from the Peruvian Amazon as a potential source of vanilla essence: quantification of phenolics by HPLC-DAD. Food Chemistry, 138 (1), pp. 161-167. Trigo-Mouriño, P.; Sifuentes, R. R.; Navarro-Vázquez, A.; Gayathrib, Ch. ; MARUENDA, H.; GIL, R. R. (2012). 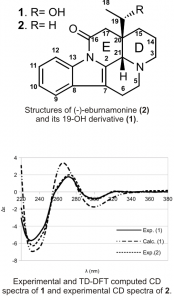 Determination of the absolute configuration of 19-OH-(-)-eburnamonine using a combination of residual dipolar couplings, DFT chemical shift predictions and chiroptics. Natural Product Communications, Vol. 7 (No. 6), pp. 735-738. Cetin, A. E.; Etezadi, D.; GALARRETA, B. C.; Busson, M. P.; Eksioglu, Y.; Altug, H. (2015). Plasmonic Nanohole Arrays on Robust Hybrid Substrate for Highly Sensitive Label-Free Biosensing. ACS Photonics, 2 (8), pp. 1167-1174. GALARRETA, B. C.; Coskun, A. F.; Cetin, A. E.; Adrianzen, D.; Altug, H.; Ozcan, A. (2014). Lensfree optofluidic plasmonic sensor for real-time and label-free monitoring of molecular binding events over a wide field-of-view. Scientific Reports, 4 (6789), pp. 1-7. Cetin, A. E.; Coskun, A. F.; GALARRETA, B. C.; Huang, M.; Herman, D.; Ozcan, A.; Altug, H. (2014). Handheld high-throughput plasmonic biosensor using computational on-chip imaging. Light: Science & Applications (Nature Publishing Group), 3 (e122), pp. 1-10. Huang, M.; GALARRETA, B. C.; Cetin, A. E.; Altug, H. (2013). Actively transporting virus-like analytes with optofluidics for rapid and ultrasensitive. Biodetection. Lab on a Chip, (13), pp. 4841-4847. GALARRETA, B. C.; Tabatabaei, M.; Guieu, V.; Peyrin, E.; Lagugné-Labarthet, F. (2013). Microfluidic channel with embedded SERS 2D platform for the aptamer detection of ochratoxin A. Analytical and Bioanalytical Chemistry, 405 (5), pp. 1613-1621. Rosseels, J., Van den Brande, J., Violet, M., Jacobs, D., Grognet, P., LOPEZ, J., Huvent, I., Caldara, M., Swinnen, E., Papegaey, A.; Caillierez, R. (2015). Tau monoclonal antibody generation based on humanized yeast models. Impact on Tau oligomerization and diagnostics. Journal of Biological Chemistry, 290(7), pp. 4059-4074. 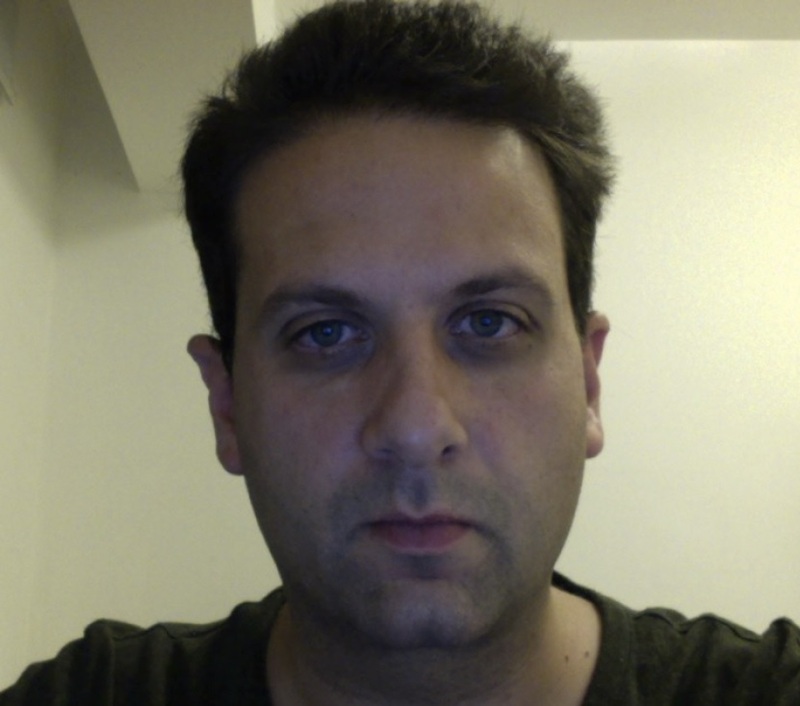 Ahuja, P., Cantrelle, F.X., Huvent, I., Hanoulle, X., LOPEZ, J., Smet, C., Wieruszeski, J.M., Landrieu, I.; LIPPENS, G. (2015). Proline conformation in a functional Tau fragment. Journal of Molecular Biology, 428(1), pp.79-91. LOPEZ, J., Ahuja, P., Landrieu, I., Cantrelle, F.X., Huvent, I. and LIPPENS, G. (2014). H/D exchange of a 15N labelled Tau fragment as measured by a simple Relax-EXSY experiment. Journal of Magnetic Resonance, 249, pp. 32-37. LOPEZ, J., Ahuja, P., Gerard, M., Wieruszeski, J.M. and LIPPENS, G. (2013). A new strategy for sequential assignment of intrinsically unstructured proteins based on 15N single isotope labelling. Journal of Magnetic Resonance, 236, pp.1-6. Dr. J. Lopez has recently joined our NMR facility and his expertise in biomolecular structural characterization and development of new NMR methodologies, achieved in an effort to learn more about neurodegenerative diseases such as Parkinson’s and Alzheimer diseases, will now be directed towards orphan endemic diseases such as Chagas, mucocutaneous leishmaniasis, and Uta ailments. TOUBIANA, D., Xue W., Zhang N., Kremling K,. Gur A., Pilosof S., Gibon Y., Stitt M., Buckler E.S., Fernie A.R., Fait A. Correlation-based network analysis of metabolite and enzyme profiles reveals a role of citrate biosynthesis in modulating N and C metabolism in Zea mays. Frontiers in Plant Science. 2016 Jul; doi: 10.3389/fpls.2016.01022. TOUBIANA, D., Batushansky A., Tzfadia O., Scossa F., Khan A., Barak S, Zamir D., Fernie A.R., Nikoloski Z., Fait A. Combined correlation-based network and mQTL analyses efficiently identified loci for branched chain amino acid, serine to threonine, and proline metabolism in tomato seeds. Plant Journal. 2015 Jan; 81, pp. 121-33, doi: 10.1111/tpj.12717. TOUBIANA, D., Fernie A.R., Nikoloski Z., Fait A. Network analysis: tackling complex data to study plant metabolism. Trends in Biotechnology. 2013 Jan; 31(1), pp. 29-36. doi: 10.1016/j.tibtech.2012.10.011. TOUBIANA, D., Semel Y., Tohge T., Romina Beleggia R, Cattivelli L., Rosental L., Nikoloski Z., Zamir D., Fernie A.R., Fait A. Metabolic profiling of a mapping population exposes new insights in the regulation of seed metabolism and seed, fruit and plant relations. PLoS Genetics 2012 Mar; 8(3):e100261. doi: 10.1371/journal.pgen.1002612. TOUBIANA, D. and Fait A. Metabolomics-Assisted Crop Breeding Towards Improvement in Seed Quality and Yield, in SEED DEVELOPMENT: OMICS Technologies toward Improvement of Seed Quality and Crop Yield: 453-475; AGRAWAL GK and RAKWAL R, Eds. Springer, 2012 Aug.